Naysayers will cite the Windows Phone debacle over the years and the past three iterations of the Surface as a reason to not take Microsoft seriously. 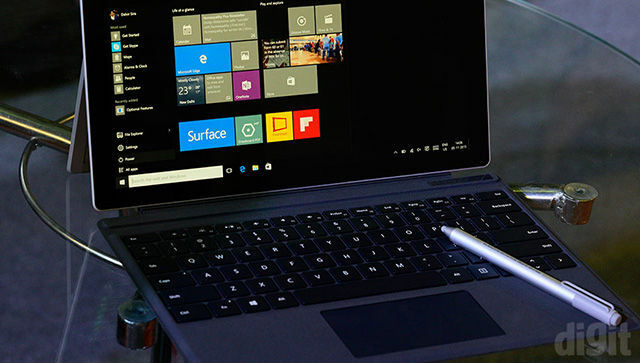 But come on, we’re pretty sure you were impressed by the keynote announcement last month in which you saw not just the Surface Pro 4 but also a host of other devices including the Surface Pro 4, Surface Book, 950 XL and the HoloLens. Several pundits (us included) hailed it as a major comeback for a company that was struggling to stay relevant. 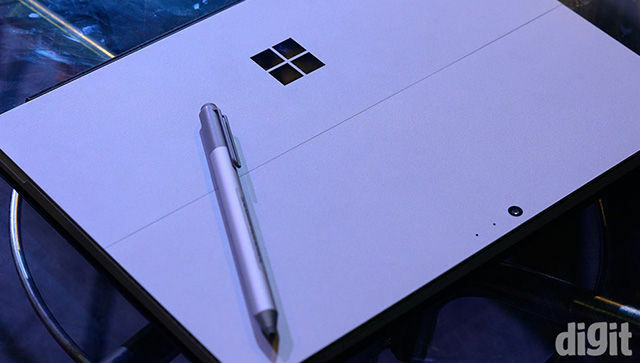 At today’s #FutureUnleashed event held in Mumbai, Microsoft CEO Satya Nadella, announced that the Surface Pro 4 will hit Indian shores in January next year. A little late but we’ll take it. At the same time, many of us were left wondering how good this “laptop replacement” device really is. Thankfully there was an experience zone at the event and we did get a few minutes of hands-on time with the device. Nearly not enough to get a full picture but surely enough to scratch the surface (wink, wink). The device we found in the experience zone had its Type Cover keyboard flap closed. When we peeled it open we were greeted by a lock screen. After fetching the person who’s account was associated with that particular device we saw Microsoft Hello in action. The Surface Pro’s infrared blaster scanned the Microsoft rep’s iris and the device unlocked. Just out of curiosity we made her keep her eyes closed to see what happens. Yup, it didn’t work. 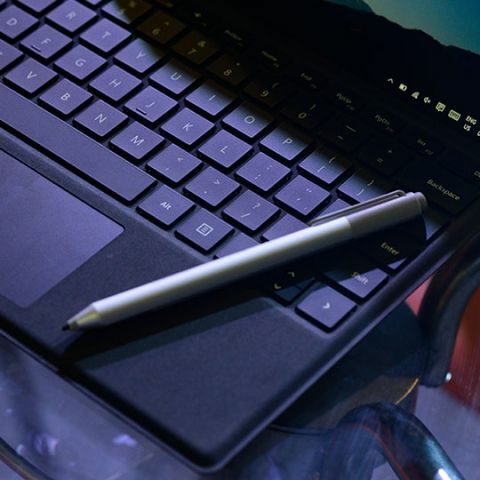 The Surface Pen is the first thing you notice when you take the device in your hands. It sits magnetically attached to one of the vertical edges and you immediately want to pull it out and try it on the screen. The thumb click at the top is also an eraser. Click it once and you can wirelessly open OneNote, click it twice and you can take a screenshot that you can annotate with the pen and long pressing the click evokes Cortana. There were some issues with either calibration, ambient noise or the Internet connection but Cortana refused to listen to our most earnest requests. Not a great loss because Cortana has failed Nadella too in the past. The way the Pen “feels” on the screen has been talked about quite often in other foreign videos we’ve seen as yet, and we concur. It runs quite nicely offering just the right amount of friction. Doesn’t feel like a real world pen but it’s not nails on glass either. The 1,024 levels of pressure sensitivity can be witnessed almost immediately – you press harder and the ink on the screen “flows” thicker. 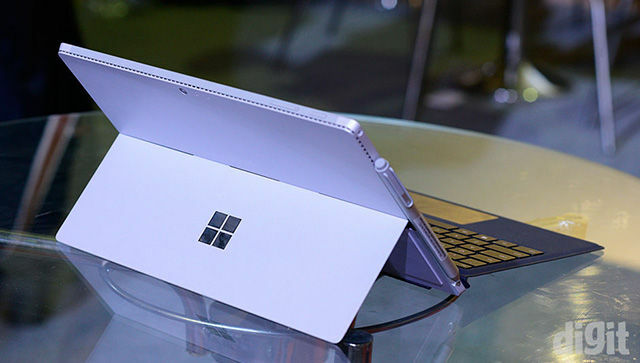 If the Surface Pen is the first thing you notice, the first thing you really try out is the keyboard. The tactile feedback is pretty decent, thanks to the key travel that’s now been added. We don’t think anyone will complain about the chiclet layout because the keys are quite well spaced out now. The keyboard is also backlit and it draws a bit of power from the screen for enabling this. The only crib we have here is that the whole keyboard bends when typing a little vigorously. In short, your ALL CAPS RAGE fits will not be willingly supported. The kickstand is fairly rigid and it holds fast at the angle you want it to. Using it on the desk comes naturally but for lap use it feels a bit clunky. When you break away the keyboard cover, the screen automatically switches to the tablet mode. Now, evaluating how well the device works as a tablet will require more time. The complexity of that discussion also lies in the kind of touch optimised apps the Windows ecosystem has to offer. Incidentally, since we were talking about pulling apart the keyboard from the screen, we noticed that the magnets on the locking mechanism for the hinge work quite well. You don’t really have to look for the notches or take any special care to align them perfectly. They just click into place seamlessly – similar to what we experienced on the Acer Switch hybrid devices at IFA Berlin. Build quality you ask? It feels like a sturdy device. The all magnesium body looks premium-ish, and feels quite nice to touch as well. What kind of hardware does it house? It’s powered by 6th Gen Intel Core m3, i5, or i7 CPUs and the RAM can scale from 4GB to 16GB depending on the option you choose. Packing all this in a package that weighs anywhere between 766 to 786 grams is quite something. Bonus: The 950 XL was also being showcased at the event but unfortunately, it was a “prototype” device so we weren’t allowed to shoot pictures or videos. The demo was primarily intended to highlight the capabilities of Windows Continuum. When connected to the display dock, the phone was able to run full screen versions of apps like Excel and PowerPoint (even play 4K video) on a large display and while doing so, it was fully available for performing phone tasks like sending SMSes or viewing pictures etc. Quite interesting.